Consider neatly groomed sites, special places to land the carp and excellent access to all sites around the entire lake, where night fishing is allowed everywhere. The carp are exceptional with not only a lot of fish, but also very big ones. The Etang du Lambon was created primarily as a tourist attraction nearly 40 years ago with the main aim of attracting bathers. Today, swimming is prohibited and the lake is a paradise for anglers with great facilities. The beautiful Etang du Lambon is fed by a river with the appropriate nickname Lambon. A dike surrounding ensures that the water is kept in check. Etang du Lambon currently consists of 80% mirror carp, plus some very large common carp and many beautiful leather carp. The beauty is that the average carp file is of reasonable age, giving much heavier catches. The average catch is above average with a 12 kg weight. However, the lake contains many carp weighing 20 kilograms or more, with a record carp of just a little over 30 kg. Etang du Lambon also is becoming increasingly popular with anglers because of the many large pike. Another nice catch are sturgeon, the largest of which specimens have a length of 1.20 meters. The Etang du Lambon has a maximum depth of 6 meters and therefore is ideal for carp fishing. The beginning part, where the river flows into the lake, on average, the depth of about 5 meters. A large part of the lake has a sandy bottom with many parts of 50 centimeters deep. So it is really important to find the right sites. A big advantage is that there is hardly any nuisance from seaweed and algae, even in the summer months. In addition, this long lake is never wider than 100 meters making it impossible to fish at great distances. The best catch results are therefore near the banks or in the area where the river runs into the lake. Fishing is allowed on the whole lake with the exception of the small piece of (sand) beach. An angler can fish for a maximum of 96 consecutive hours on one spot with one bivvy. In total there is space for 10 anglers around the lake, which can obtain their license online. The local administrator (FDAAPPMA) is Deux-Sèvres' . 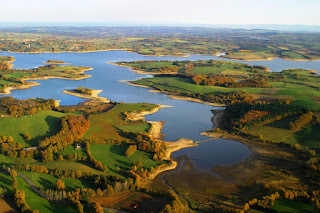 Near Etang du Lambon are the fisheries of Parc Soubise and Lac de Villedon . Read these articles on our Dutch website.